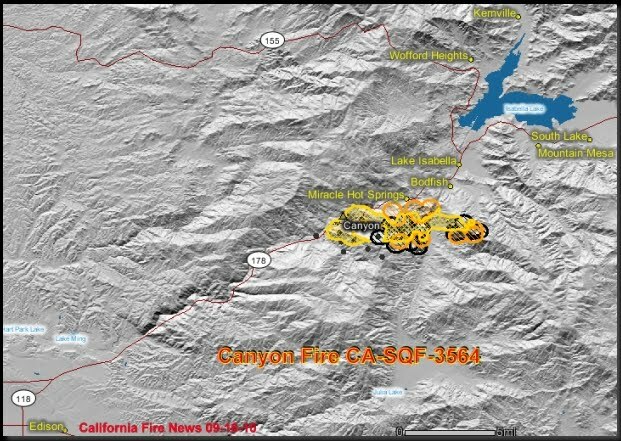 Canyon Fire CA-SQF-3564 9,820 acres, 75% contained. 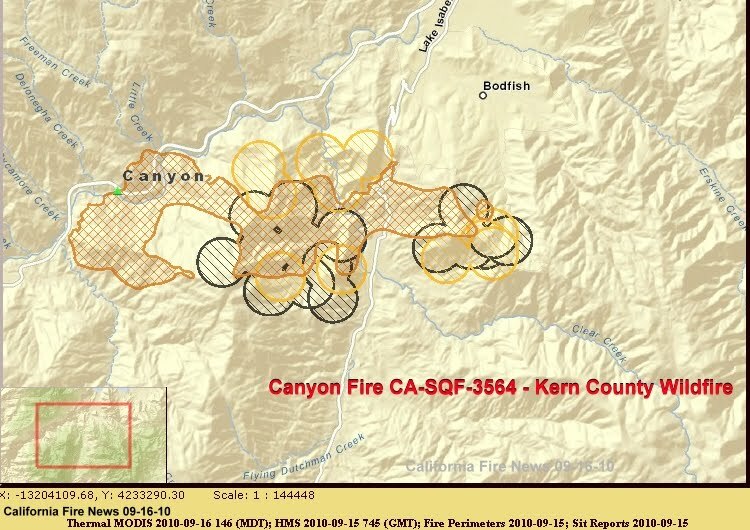 All further updates at: Canyon Fire CA-SQF-3564 9,820 acres, 75% contained. Road closures are still in effect on Old Kern Canyon Road. KCFD fire investigators are requesting public help. At the start of the fire on Sunday there were several parked cars along Hwy 178 taking photographs of the fire. Investigators would like to see those pictures. They can be e-mailed to fireinfo@co.kern.ca.us. Date & Report Time: 9/12/2010 @ 2:00 P.M. The Canyon Fire started September 12, 2010 at approximately 2:00pm in Lake Isabella, Ca. Initial assessment and attack began immediately by Kern County Fire, US Forest Service and BLM. Unified command was established with Kern County Fire, U.S Forrest Service and BLM. Southern Central Sierra Interagency Incident Management Team assumed command of the fire on September 13, 2010 at 6:00P.M. Estimated date of containment is September 19. • Continued air support of line construction and improvement; continue mop-up operations. • Hand and engine crews are in place for structure protection along with air support. • Steep ground and active fire are still major concerns. Air resources continue to play a key role in keeping the fire away from high risk areas. Some damage was sustained by the 66 KV power lines; local power company has started repairs. Life and safety is priority and evacuations were established. A shelter has been established in Lake Isabella Senior Center. To contact the Lake Isabella shelter, please use 1-661-333-0265. A second shelter center has been established in Twin Oaks at the community church, which is located at 16115 Caliente Creek road. Twin Oaks church is also available for small and large animal sheltering, if you need to contact the shelter please call 1-661-867-2550. Cooperating Agencies: South Central Sierra Incident Management Team, Kern County Fire, U.S. Forest Service, B.L.M., K.C.S.O., C.H.P., Cal Trans. News and Notes: CA-SQF-3564 8,149 acres, 65% contained. Unified command with Kern Co, BLM, NPS and USFS. 250 structures are threatened, 1 structure destroyed. An evacuation center has been established at the Kern River Valley Veteran’s/Senior Center. 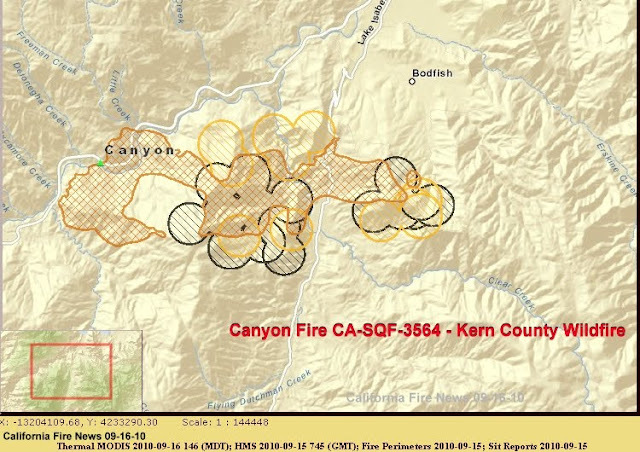 Evacuations remain in effect for the area of Meyer’s Canyon south of Bodfish Canyon Rd. at Junction of Rocky Rd. Advisory evacuations are in place from Meyer’s Canyon north in the community of Havala. Almost 30 people spent the night in the Red Cross Shelter, at the Lake Isabella Senior Center, due to the Canyon Fire in the Bodfish and Havilah area. SCE is currently working to restore power to the damaged electrical transmission line and the community of Havala. WX: SHOWERS IN THE SIERRA LATE SUNDAY NIGHT IN THE FORECAST.